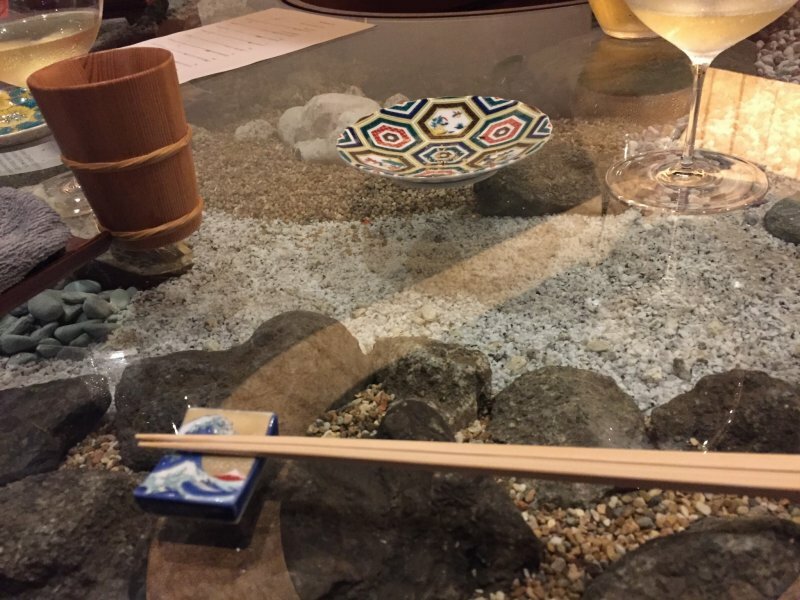 Chef Yoshiaki Takazawa opened this eating bar around the corner from his popular restaurant that also bears his name. 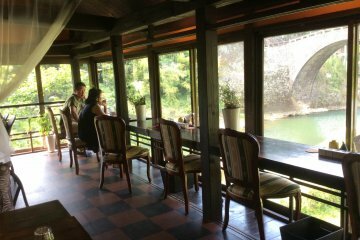 Located in Akasaka, it is a small venue that seats ten guests. 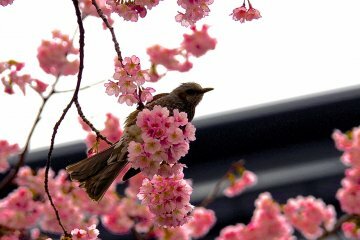 We had contacted Takazawa restaurant for a reservation request. Unfortunately, they were going to be closed for the month but lucky for us, they were offering a short tasting menu from their restaurant at their bar and still had space available. 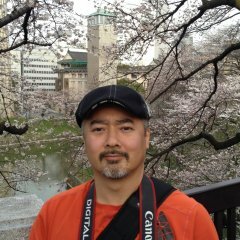 We confirmed our booking with Chef Takazawa's wife, Akiko, very easily through a couple of e-mail exchanges. We were greeted at the door by our host for the evening. He was a young man originally from Canada, with a vast knowledge of beverages. We sought his advice for our wine selection based on the menu for the evening. 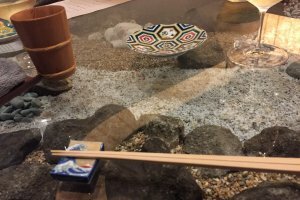 Our dining style was considered "omakase", where the chef chooses the menu based on the best ingredients available that day. Since the early part of the meal would contain seafood, he recommended a white wine to start and a red wine later to pair up with a red meat serving. 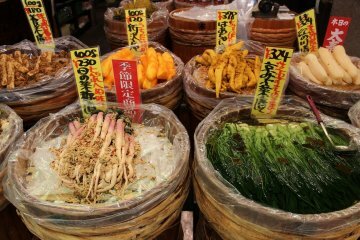 As per Chef Takazawa's style, his ingredients have a Japanese origin but are prepared with French techniques. On this evening our menu consisted of ten servings, each freshly prepared and then presented to us by our host, accompanied by a little background and instructions on how to enjoy it. For most servings, our host was able to tell us the specific area the main ingredient came from. Opening the menu was an edible aperitif, referred to as "Beer for Cheers! ", consisting of a very thick, bonito-flavoured beer. A spoon was provided to help gather up the thick contents. It was fishy and salty but quite interesting. 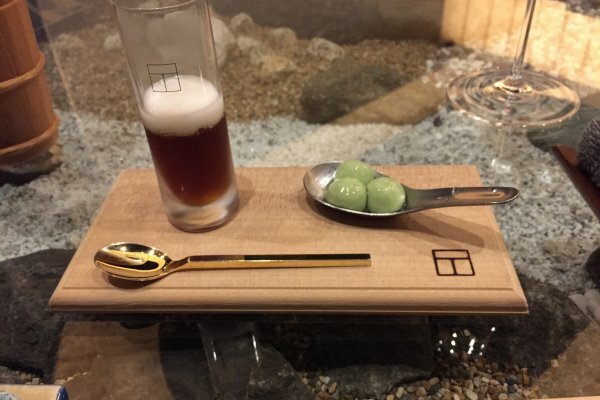 Served alongside were three cooked edamame pods in a spoon. Our instructions were to consume each completely and not to bite into them, as the insides were very fluid. Each pod was like its own little self contained soup. 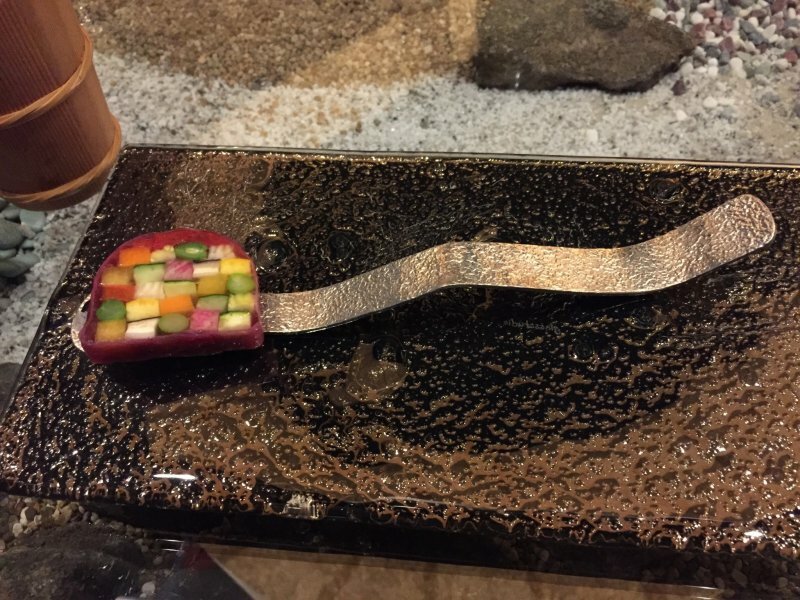 Following the cheers was Chef Takazawa's signature dish "ratatouille", an artful display of individually-prepared components referred to as "vegetables of the sea" by the Chef himself. 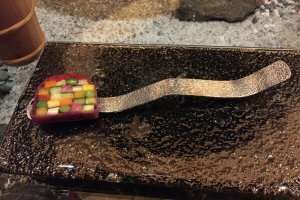 They are then assembled together and served on a stylish spoon with one pepper corn and two grains of salt. Instructions for this was to simply slide the serving off the end of the spoon taking in the pepper corn and salt grains. It was incredibly delicious, as the many flavours harmonized nicely. Next up was the "Trip to Sado Island". 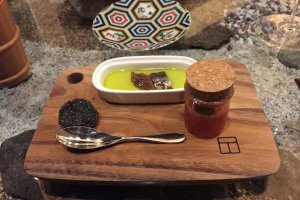 This consisted of a sardine in olive oil served with black crackers and diced tomato, much like salsa and mini toasts. The diced tomatoes were excellent on top of both crackers and toasts and helped tame the saltiness of the sardine. You could also dip the toasts into the olive oil. 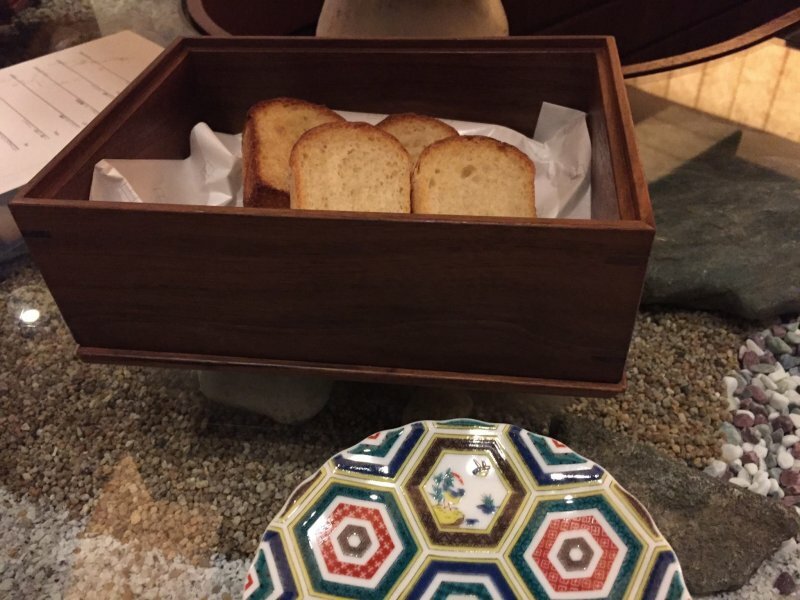 The mini toasts were so fresh and tasty that we wanted the entire loaf!! 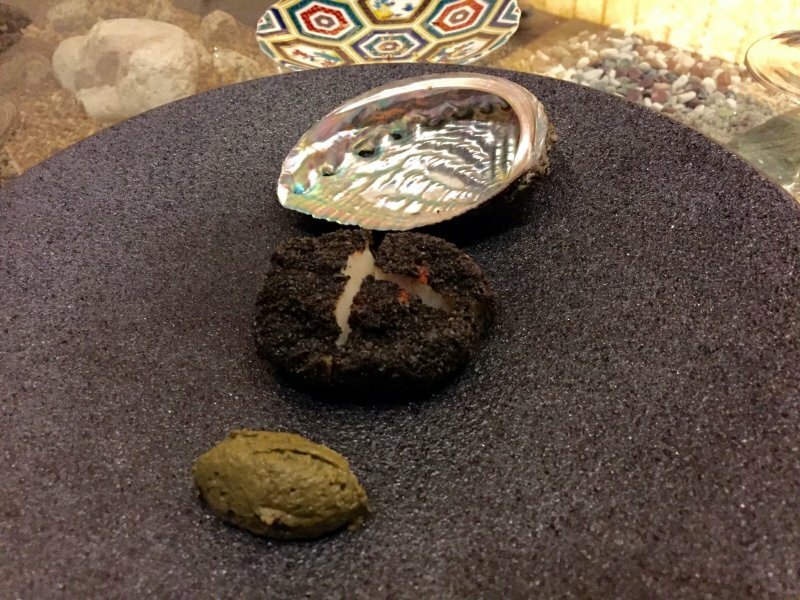 The fourth serving was abalone. 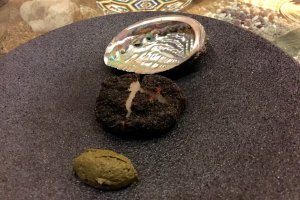 It was served with its shell on top and accompanied with a green paste made from its own extracts. The abalone was very tender and moist, with incredible flavour. The underside of each shell displayed its own unique spectacular show of colours. 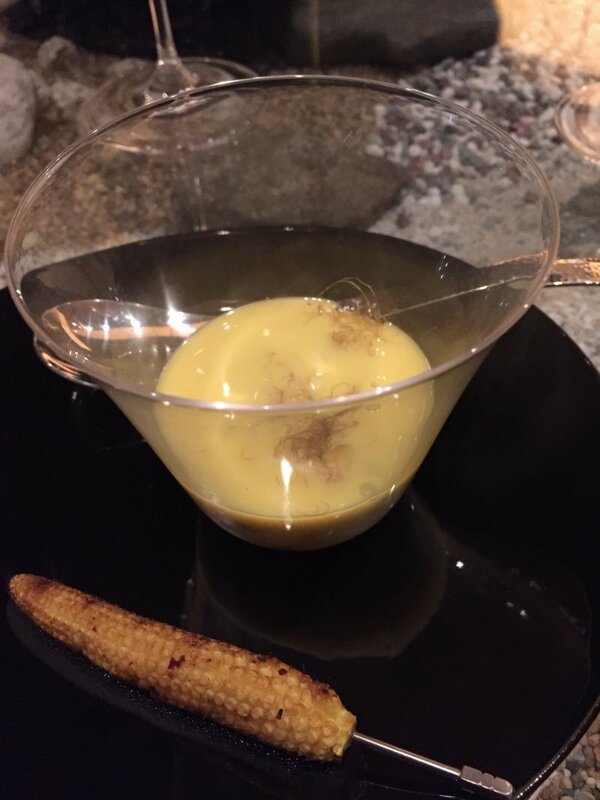 A smoky corn soup served with a baby corn on a skewer followed. 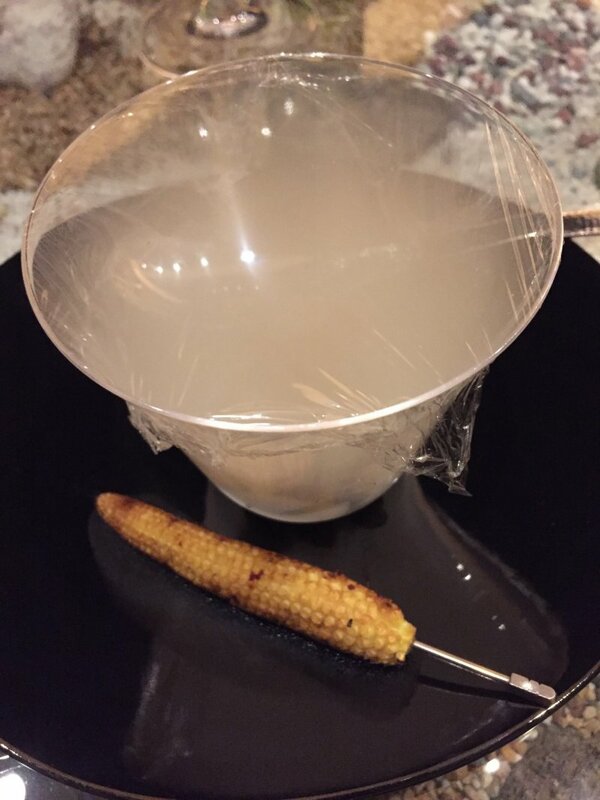 Smoke was injected into the bowl and covered a with plastic wrap until serving. The baby corn could also be dipped into the soup. The smoky flavour was quite prominent and initially perceived to be too strong but I personally enjoyed the flavour. 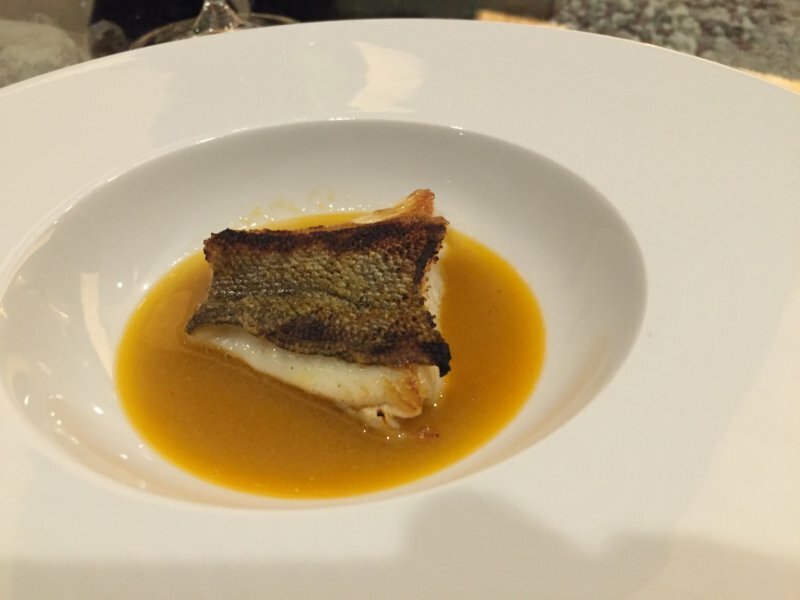 The next serving was a bouillabaisse featuring ainame (known in English as 'greenling'). 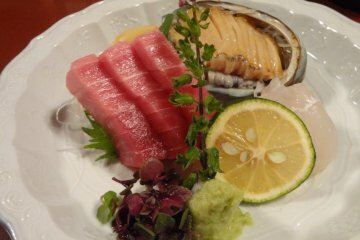 Ainame is mild tasting seasonal Japanese fish that lives along rocky shores in highly salty waters. The flavours harmonized nicely and were very delicious! A Tokachi mushroom salad was served next. 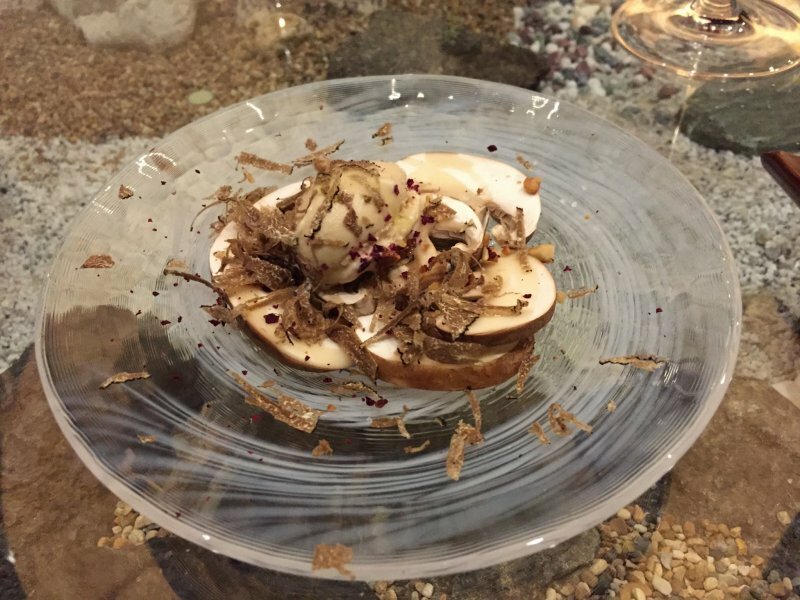 Sliced mushrooms from Tokachi, a district of Hokkaido, were served with shaved black truffle, dried beetroot flakes and a small scoop of mushroom ice cream on top. The earthy flavour of the truffle complimented the slightly sweet flavour of the mushroom, making this a very refreshing dish. The highlight of the evening though, from an entertainment point of view, was the black fig from Sado Island, located off the coast of Niigata Prefecture. 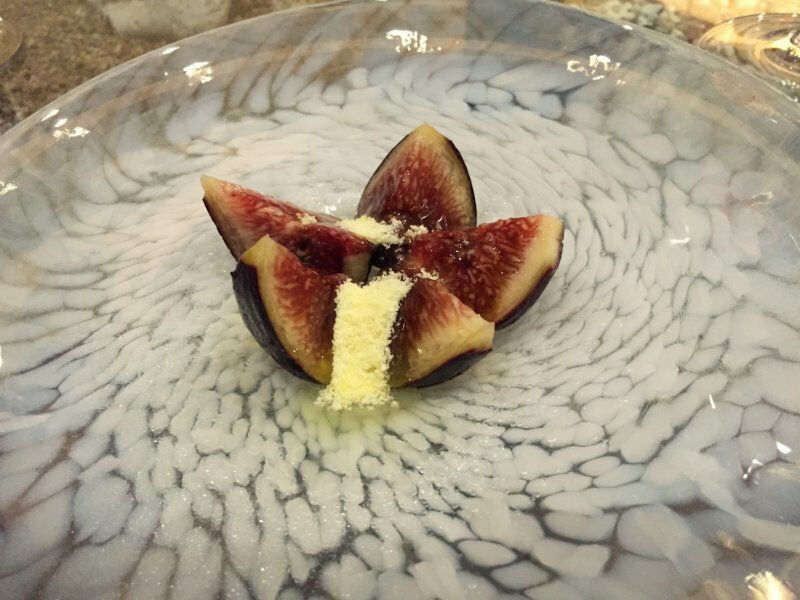 Sliced wedges of fig were brought to us on a plate and we were asked to wait a moment. 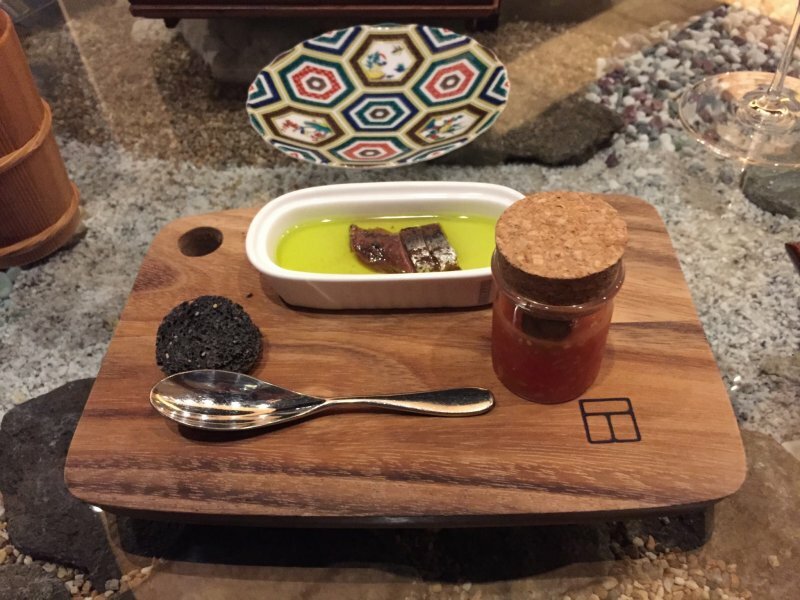 Our host returned and poured frozen olive oil over the fig. 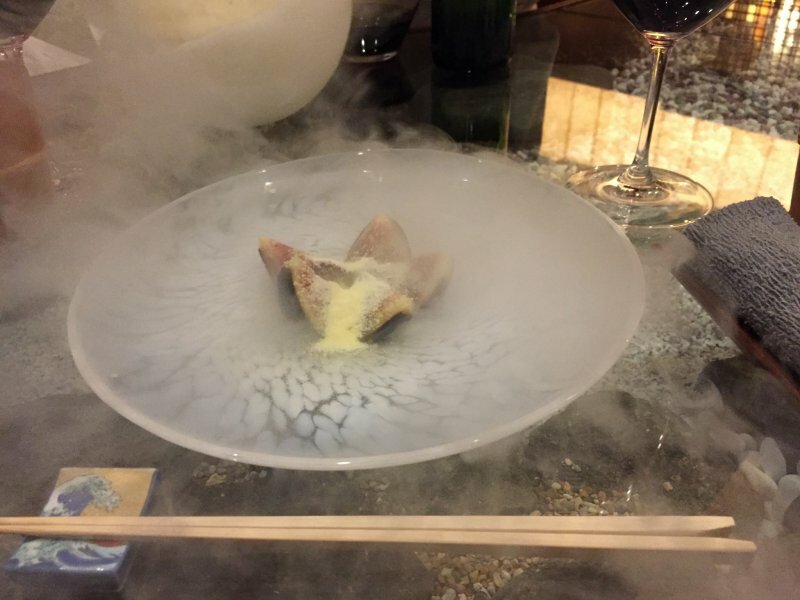 This smoky presentation settled, leaving the grains of frozen olive oil on the figs. It was an impressive display and a delicious serving. 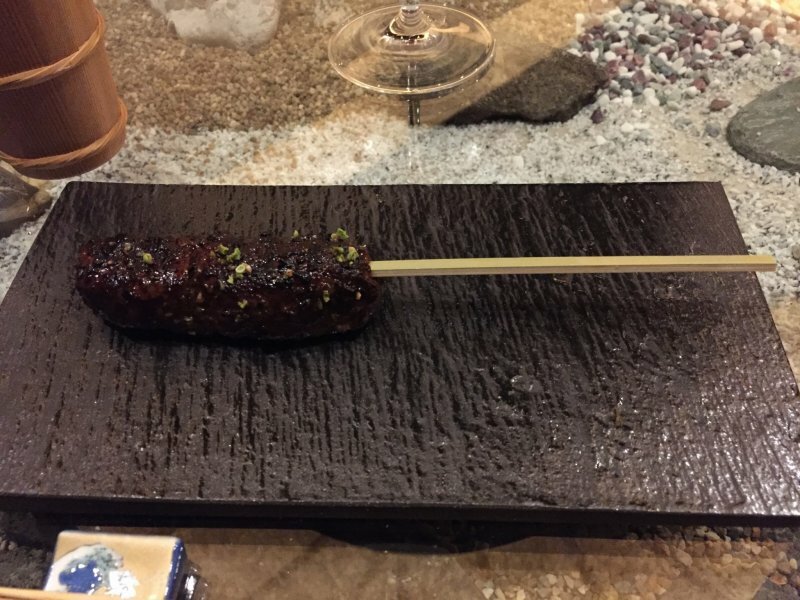 A surprising item was bear meat on a skewer. 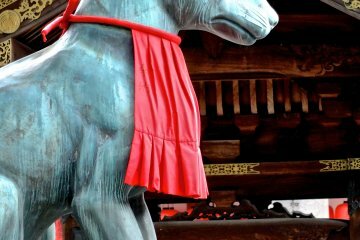 Hunted in northern Japan, it was prepared with lots of spices. The texture and taste was a lot like hamburger meat and was quite delicious. 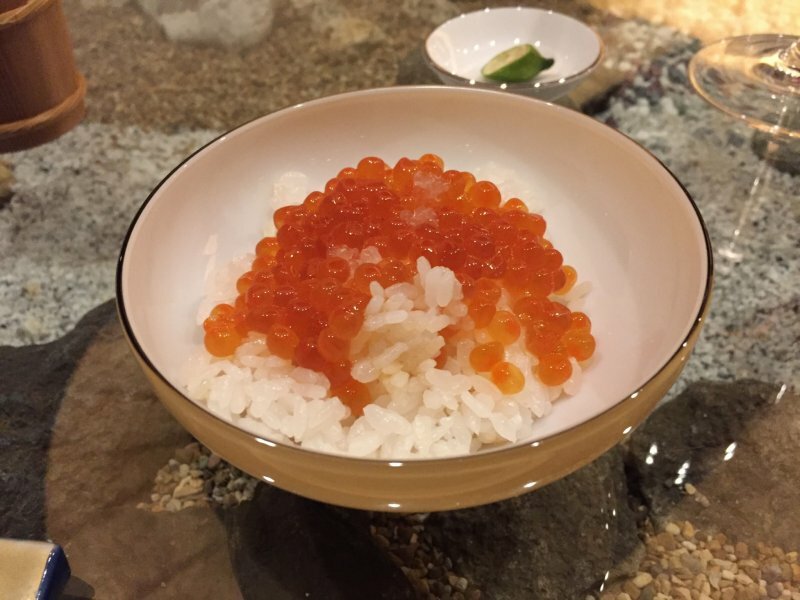 Closing out the menu was a more familiar dish of ikura (salmon eggs) on rice. This ikura was mild and not overly fishy. Always delicious with rice, it was a pleasant way to end the meal. 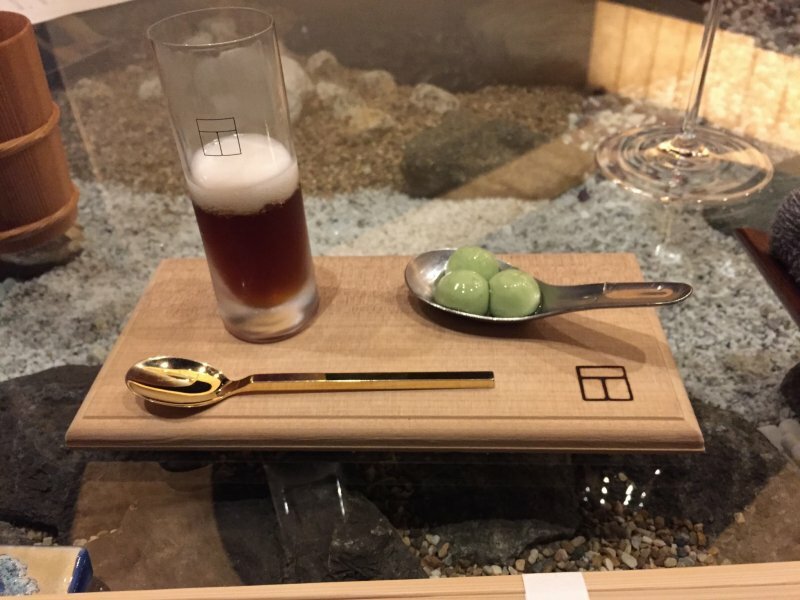 The tasting menu was paced out over the course of about an hour and a half. 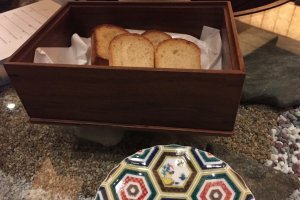 The atmosphere was relaxed and our host was attentive to our dining experience throughout the evening by keeping our water and wine glasses filled, our eating space tidy and periodically checking in to see how we were enjoying the servings. 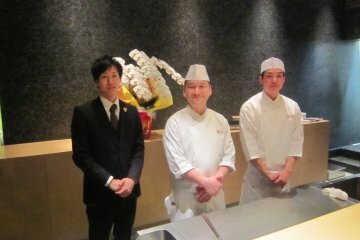 Chef Takazawa's sous-chef did a fabulous job on our evening. Everything was delicious! This was my first time enjoying a meal of this type and I found the experience very enjoyable. The quality of the food, service and atmosphere were all excellent. 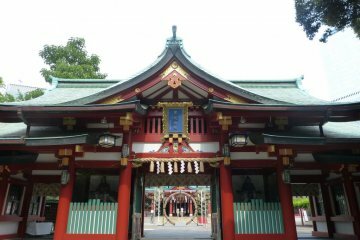 Having an English speaking server makes this a friendly venue for non-Japanese speaking guests. Normally, the bar would be serving cocktails and a short menu. You would typically be able to pop in on short notice but on this particular evening, reservations were required for the short tasting menu. There's a contact form on their website and they were quick to respond. 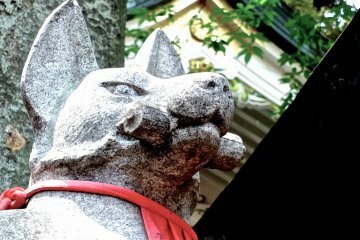 A bit higher on the price scale but if you're looking for a special evening consisting of something creative and different, plan to visit Takazawa or Takazawa Bar for a Japanese French fusion experience.